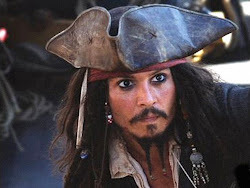 Snippets of Jack: "Never too Late to Learn"
"Never too Late to Learn"
Now the East India Trading Company has control of the Flying Dutchman and are headed to Shipwreck Cove to end piracy once and for all. Lead by Lord Cutler Beckett the E.I.T.C. armada begins to prepare for battle. However Davy Jones has already begun to charge the enemy. This is fine with Beckett so he just goes along with, confident it will beat the Black Pearl that is heading out to meet it. Right when the two ships are about to start blowing each other up a huge vortex forms, sending the ships in circles. 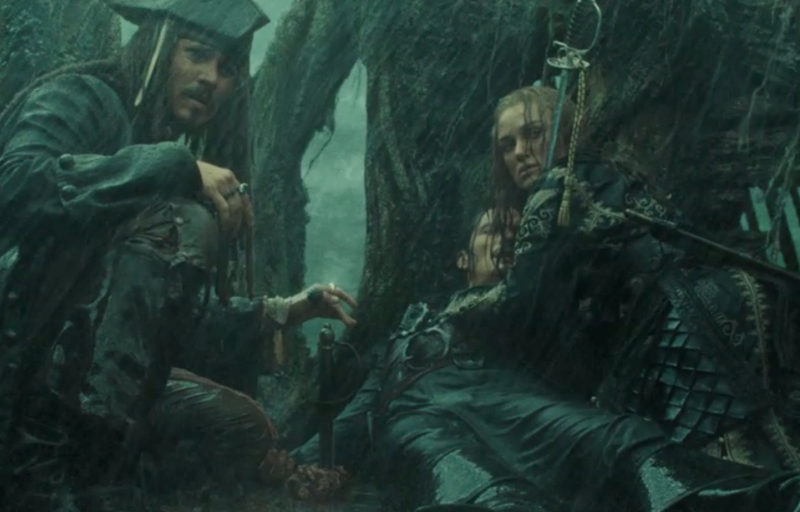 Barbossa and Davy Jones wait for the precise moment to order their crews to attack. When they do all the cannons begin to fire, each ship gets a lot of damage but this is just the beginning. After firing and firing and firing the two sides realize that this plan is taking to long and decide on a new plan: board the other ship. They swing on the ropes and if they don't fall and have a very wet death they land right on the enemy's ship. On each of the ships chaos is reigning. Meanwhile Jack is locked up on the Flying Dutchman but he finds a way to escape. Jack: "Think like the whelp. Think like the whelp. Hinges. Hinges. Leverage!" Then he opens the doors the same way Will used to free him way back in The Pirates of the Caribbean: Curse of the Black Pearl. He rushes to the place where the chest of Davy Jones is up his effects. While he does so he steals the chest from right under Murtogg and Mullroy's nose. On his way out he runs into a old "freind." Davy Jones: "Lookee here boys. A lost bird. A lost bird that never learned to fly." Jack: "To my great regret. But. . .never to late to learn, eh?" He slaps a rope and grabs on as it pulls him upward, flying through the air. But since Davy Jones can teleport on his ship he meets Jack on the mast. Jones: "The chest, hand it over." Jack: "I can set you free mate." Jones: "My freedom was forfeit long ago." And then they begin to sword fight. This duel lasts a long time and has a few funny snippets. Davy Jones: "You can do nothing without the key." Jack: "I already have the key." A little confused Jones holds up the key and says, "No, you don't. Ha. . Haha. . ." Jack: "Oh, that key." Stupid Davy Jones. Why would Jack be talking about that key? After that Jack slices of the tenticle holding the key. Then the Black Pearl and the Dutchman bump into each other and Jack falls of but grabs onto the chest that Jones is also holding. 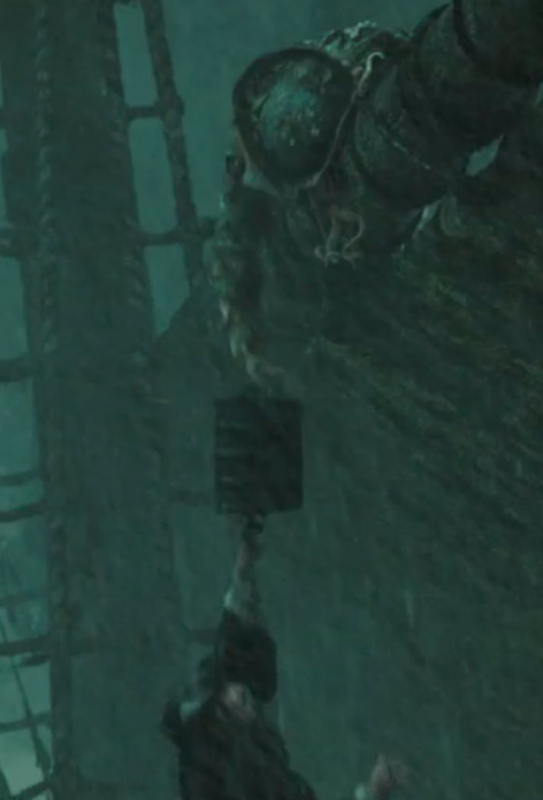 Davy Jones won't let go because he doesn't want Jack to have it. Jack won't let go because falling 50 feet probably will hurt a little. Jones flings Jack upward and he goes flying, but luckily Jack lands right on a fish dude and promptly knocks him off. While swinging around he shoots Jones in the hand, making him drop the chest. Jack and Davy Jones come to the deck to look for it. However Will finds it first but looses it while fights with his father. Will: "Stop, it's me. It's Will your son." Bootstrap doesn't get the message and continues to attack. Meanwhile Jack and Davy Jones fight over the chest. Jack hides behind a block of wood that spins around to signal the kraken. Jones just walks through the block but Jack spins it around confusing Jones. But he gets over it and chases Jack because he has no sword anymore. Jones knocks Jack down but before Jones can kill him Elizabeth comes in and starts fighting Davy Jones. Jones: "Harridan! You'll see know mercy from me." Elizabeth: "That's why I brought this." She then draws her sword and they continue killing each other. Meanwhile the tenticle holding the key worms its way past Jack. 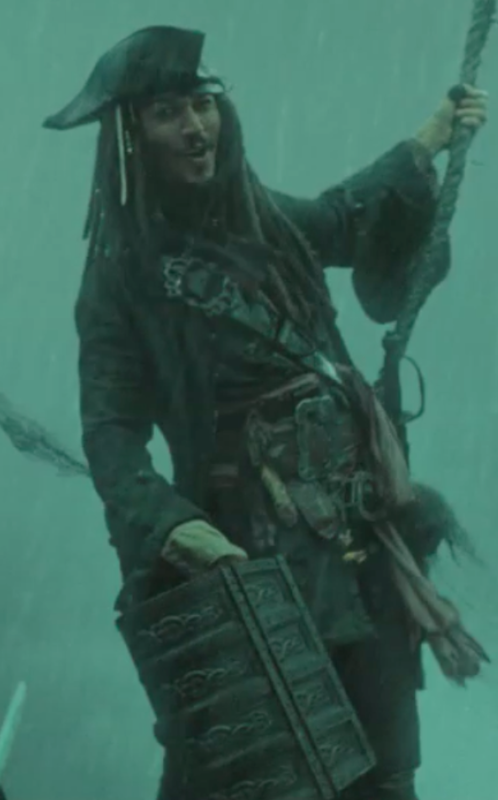 He then takes the key and the heart and after Jones stabs Will he threatens to stab it but instead he let's Will stab it saving his life and making him the immortal captain of the Flying Dutchman. do something Jack would do today!